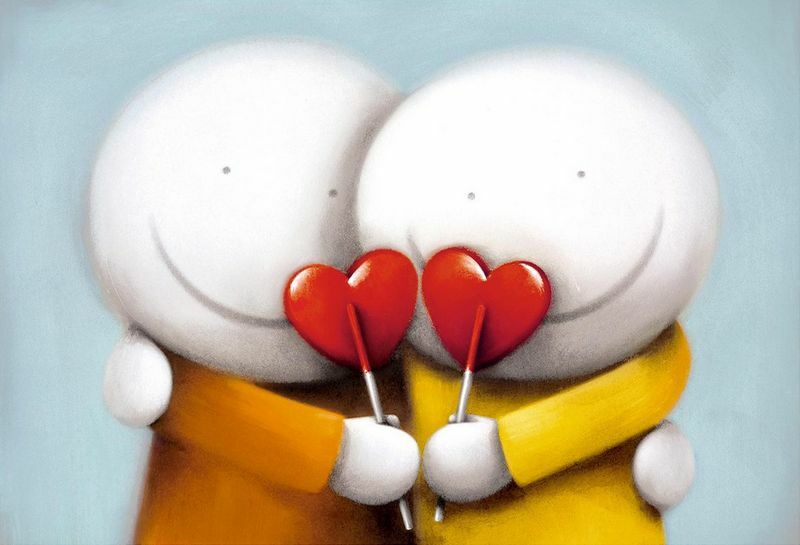 Sweethearts - mounted by Doug Hyde // £394.80. In my experience, Doug's paintings that feature hearts always create a great reaction from his fans, there is just something about the way he paints them and ‘Sweethearts’ is a wonderful example. Although depicted as lollipops 's, the hearts are painted bright red and have a polished look, as the light reflection appears to be on both upper sides of the hearts - almost gleaming with love! Remember, Hyde's universal message is that we should love and care for one another & the importance of family. He also draws us back down our timelines and remind you of your own childhood innocence and naivety in the world; it is still there, you have only forgotten. Looking at this limited edition can provide you with a lightbulb moment and boom! a softness embraces you and the world around you is lifted and changed forever.